1. Entry Door for easy access and cleaning. 2. Siding: 50-year MFG warranted LPSmart Side in choice of color. 3. Roof: Lifetime warranted shingles. 4. 10” Overhang to protect open windows from rain. 5. Lots of Windows for light and ventilation. 6. Nesting Boxes: Shingle roof with flashing to eliminate leaks and rotting. 7. Gather eggs from outside with ease! Egg collection doors with spring-loaded hinges. 8. 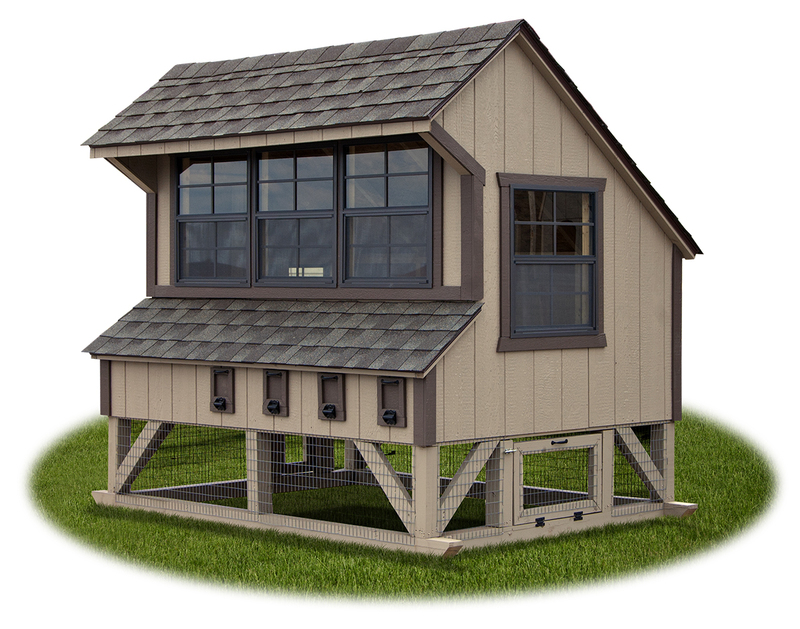 Bottom Area Enclosed with Wire: Allows your chickens to get out in the open air, provides protection from hawks and other predators, and provides shade on hot summer days. 9. Sturdy pressure-treated 4x4 Construction. 10. 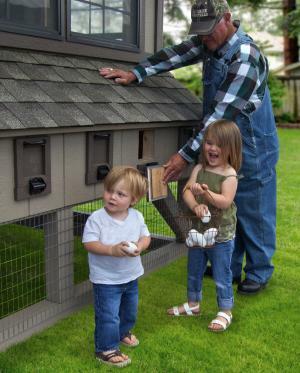 Easy Turn-Out Door allows your chickens to range freely. 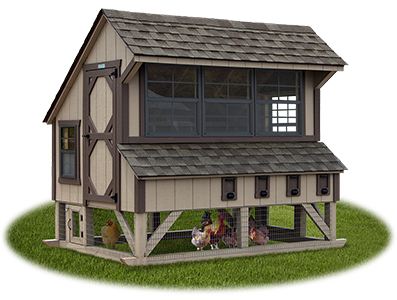 Built-in Roosts foryour chickens’ comfort. 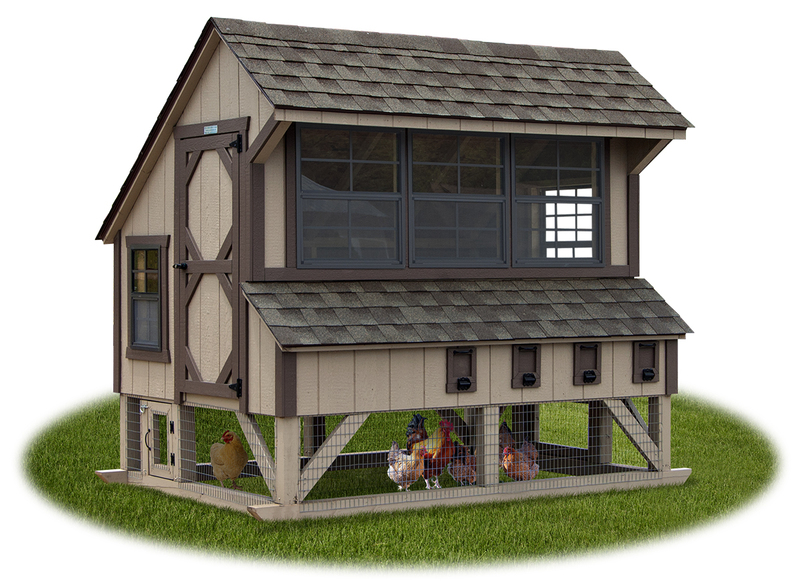 Built-in Ramp drops down to allow chickens access from the upper coop to the open bottom area. (Ramp is on hinges and closes by simply pulling a string). The eggs you buy at the supermarket have a pale yellow yolk, because most supermarket egg chickens never see the natural light of day, or feel the natural breezes blowing. They never even get the chance to do just a short healthy sprint during their production period because of being confined to cages, only allowing them a minimal amount of space. Chickens naturally like to get out in the dirt and grass to do their scratching and pecking, therefore increasing the quality of your eggs. If you raise your own eggs you will experience an orange yolk— the way an egg was meant to be! 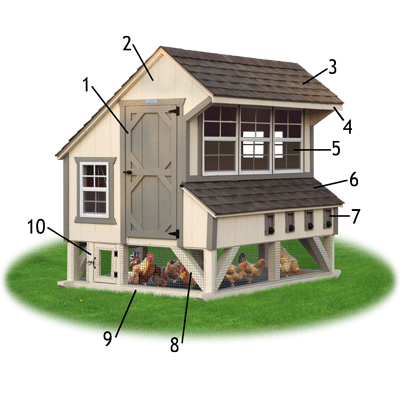 Chickens will share their nesting boxes—one box will suffice for up to eight chickens. Chicken manure is one of the richest forms of fertilizer for your yard or garden. Read more about chickens HERE, thanks to Mrs. Andy Mast.